It is a significant increase as the government has not seen more than 2 per cent rise in its actual spending for subsidies since 2013/14. However, the year 2013/14 saw a decline of 1 per cent in its actual spending compared to the previous year under this head. The Central government's spending on subsidies is set to jump around 5 per cent, at Rs 2,72,276 crore in 2017/18, from its revised estimates of Rs 2,60,485 crore in 2016/17. It is a significant increase as the government has not seen more than 2 per cent rise in its actual spending for subsidies since 2013/14. However, the year 2013/14 saw a decline of 1 per cent in its actual spending compared to the previous year under this head. Actual spending on subsidies grew on an average of around 43 per cent of the budgeted estimates of the government since 2006/07. The growth however, slowed down to 10 per cent and 8.3 per cent in the years 2013/14 and 2015/16 respectively. Again, the year 2014/15 saw a decline of around 1 per cent in its actual subsidies compared to its budgeted target. Also, the total subsidies were revised downwards to Rs 2,60,485.5 crore in 2016/17 from the budgeted estimates of Rs 2,63,141.4 crore in 2016/17. The total subsidies include food subsidy, fertiliser subsidy, petroleum subsidy, interest subsidies and many others. 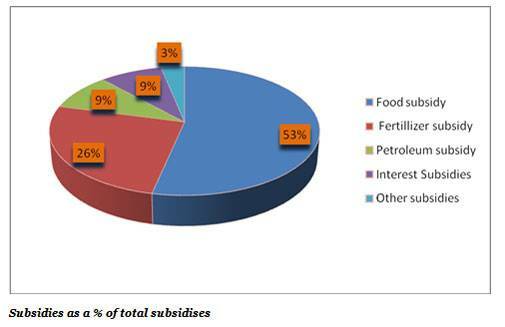 Food, fertiliser and petroleum subsidies are the three major subsidies constituting currently 88.3 per cent of the total budgeted estimates for 2017/18. Of this, food subsidy accounts for the largest chunk of the total subsidy. The share of food subsidy as a per cent of total subsidises has been constantly rising over the past five years, with an exception in previous year when the revised estimates of food subsidy as a per cent of the total inched down compared to 2015/16. An increase in food subsidy escalated the overall subsidy burden for 2017/18. The food subsidy bill increased around 8 per cent to Rs 1, 45,339 crore in the budget estimates of 2017/18 from the revised estimates of Rs 1, 35,173 crore in 2016/17. It was revised upwards to Rs 1,35,172.96 in 2016/17 from the budgeted estimates of Rs 1,34,834.61 crore in 2016/17. The revised estimates are however, 3 per cent lower than the actual food subsidies of 2016/16. The budgeted estimates for fertiliser subsidy remained unchanged at Rs 70,000 crore in 2017/18 while the petroleum subsidy declined for the fifth consecutive year to Rs 25,000 crore in 2017/18 from the revised estimates of Rs 27,532 crore in 2016/17.